My name is Jerry Duran. I started racing mountain bikes in Colorado in 1986, and since then I have ridden many miles in many different locales. 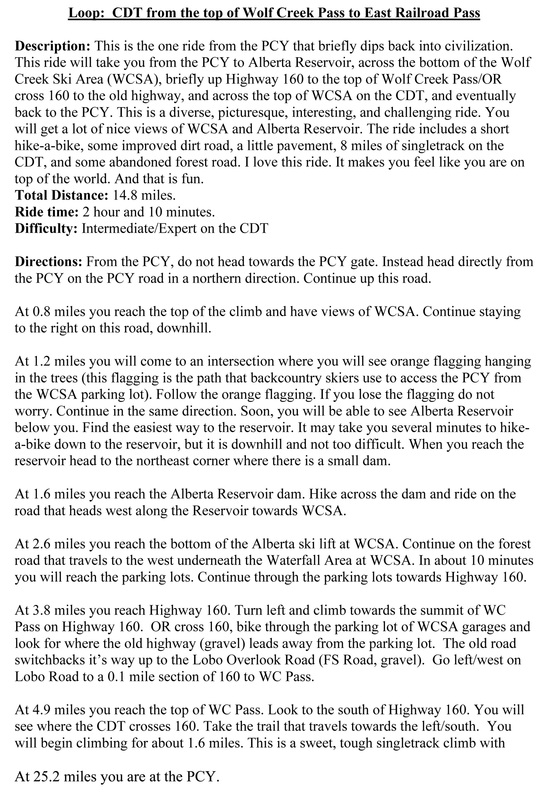 When Mark and Sandy asked me to evaluate the mountain biking from the Pass Creek Yurt, I jumped on it. What I found was exceptional. The Pass Creek Yurt provides direct access to 18.6 miles of CDT nonWilderness singletrack. The CDT is epic mountain biking for the advanced rider! The CDT is amazing, challenging, exhilarating, beautiful, and occasionally a little scary, but mostly it is a blast. 62 miles of mapped riding are available out the door. The Pass Creek Yurt provides access to a variety of riding terrain: singletrack, ATV trails, four-wheel drive roads, abandoned roads that are closed to motorized vehicles, and improved gravel roads. No matter which ride you choose, you are riding in magnificent beauty. This is high country riding in the majestic Southern San Juan Mountains of southwest Colorado. Come ride at 11,000 feet, and beat the summer heat. Come ride where the air is fresh and the smells are sweet. When you have had your fill of riding or the weather gets ugly, the cozy Pass Creek Yurt awaits. Exchange your suffering for celebration and reliving your adventures. It has been my pleasure to explore and map the mtb network surrounding the Pass Creek Yurt. Ride one of the crown-jewels of American mountain biking! It is truly sublime. If you want to experience something special, Ride the Divide from the Pass Creek Yurt. 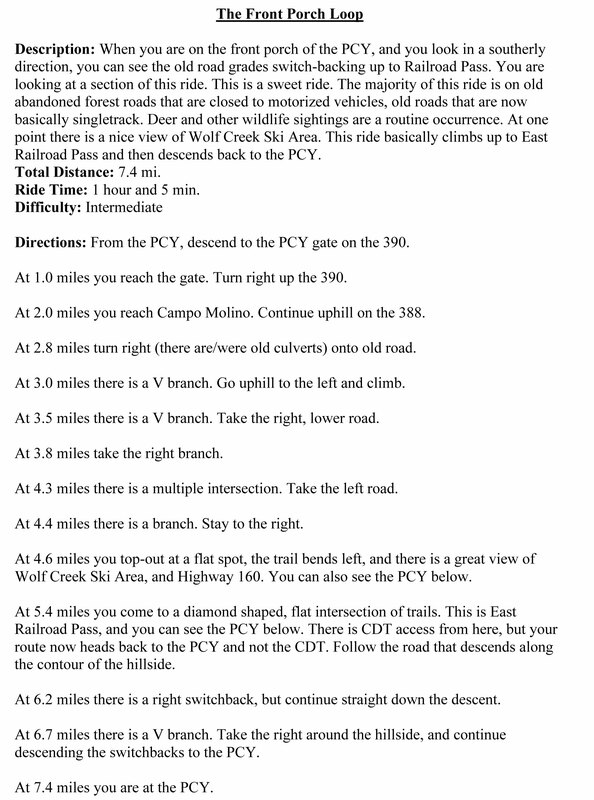 I suggest you always carry a copy of the complete PCY riding map for reference when you are riding. Using a ride-timer and a cyclometer are critical. I have selected several rides and there are specific maps and directions for those rides, but there are many options. Be prepared for changes in weather. At this altitude in the Rocky Mountains things can change rapidly. 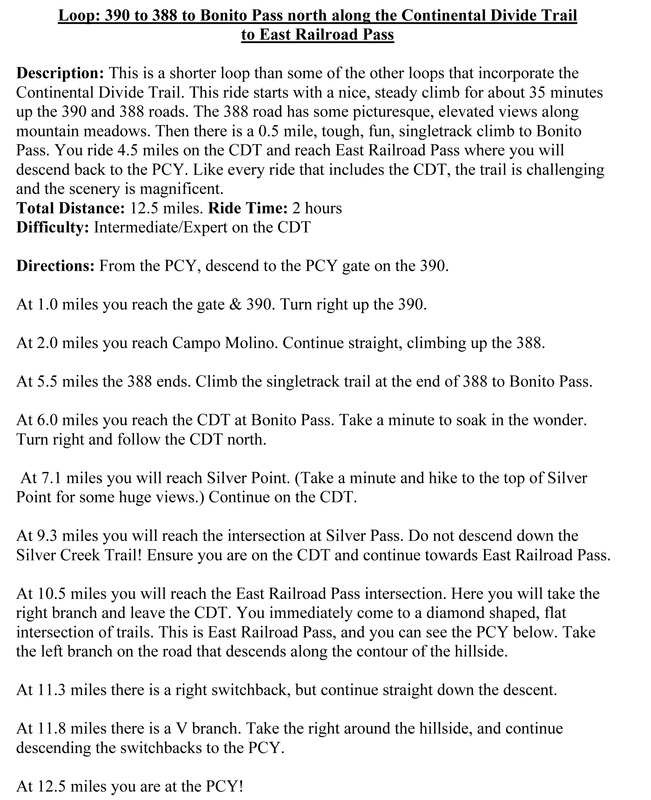 If you are unfamiliar with riding the CDT, remember the comments that I wrote in the PCY Introduction on the website. It is a high altitude, challenging, singletrack with a fair amount of exposure and sections where there is side-hilling on steep slopes. It does take some skills and is not for the novice. However, the rewards are substantial. Do not descend below the CDT unless you want a major effort to come back up to the CDT as everything is brutally steep. This includes the Silver Creek Trail. The map also shows a trail at Bonito Pass that descends to the McCormick Cabin. This trail is nonexistent. There are five different access points to the CDT from the PCY: the top of Wolf Creek Pass, East Railroad Pass, Silver Pass, Bonito Pass, and the top of FR385. If you are riding the CDT and are fatigued or caught in bad weather, you may be able to use one of these access points to shorten your journey back to the PCY. The access at Silver Pass is obscure. From the CDT descend the contour headed northeast and stay left of the creek. You will reach the 388 Road in several minutes. Use the map. Major intersections are marked on the map with a bold V shaped symbol. The distances and ride times are marked between these points. The distances are to tenths/mile. Ride times are marked with an arrow for the direction of travel. 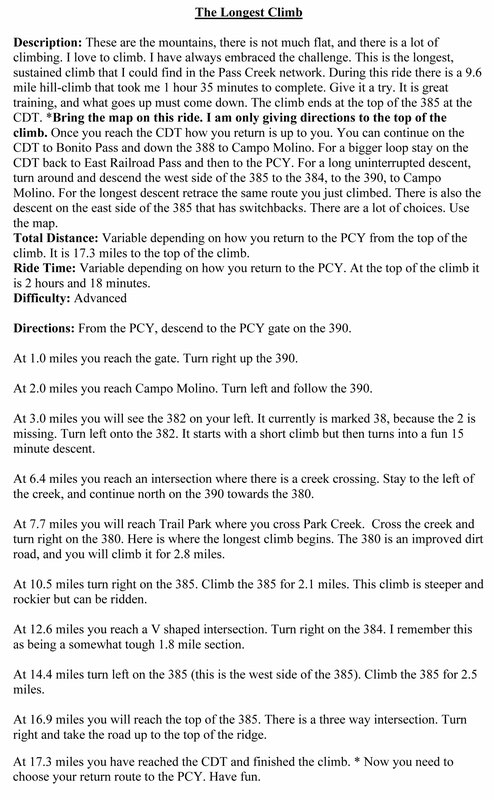 By comparing the two times you can know if that direction is mostly climbing or mostly descending. Remember distances and times are subjective. I measured the mileage with my cyclometer and yours may vary. Ride times are relative to fitness and intensity of riding. Use the maps for reference. The Difficulty ratings for each ride are subjective. Any riding on the CDT I consider Expert level, because it is a tricky singletrack. Many of the rides I rate Advanced can be ridden by anyone. They are not very technical they are just tough due to climbing or descending. There is not much flat around the PCY. I used USGS 7.5 Minute Series Quadrangle maps for this project. They may contain slight discrepancies compared to actual position. The USGS maps show Railroad Pass in two different locations. For convenience, I have named them East and West Railroad Pass. All of my route descriptions start from the PCY, but you can vary rides and terrain by driving to different starting points. There are many options. My routes are based on the direction of travel that seemed to work the best, but they can be ridden in either direction. Other suggested rides: Ride to Swale Lake for a picnic it is a nice spot. For singletrack mania ride the CDT as far as you want towards Elwood Pass and then ride it back. There is some hike-a-bike, but it is mostly great riding. At the PCY if you want to hang-out with a big overlook. Ride the PCY road towards the north for about five minutes and you will have a beautiful view. To download the below files to your mobile device, click on the JPG option for the desired guide below, which will open the guide in a larger version in a new window. Once there, press your device’s screen, on the guide’s image, until that “save image” option (or the equivalent) appears. Click “save image” and the guide should be saved in your device’s local photo gallery. Ride Time: 2 hours and 40 min. 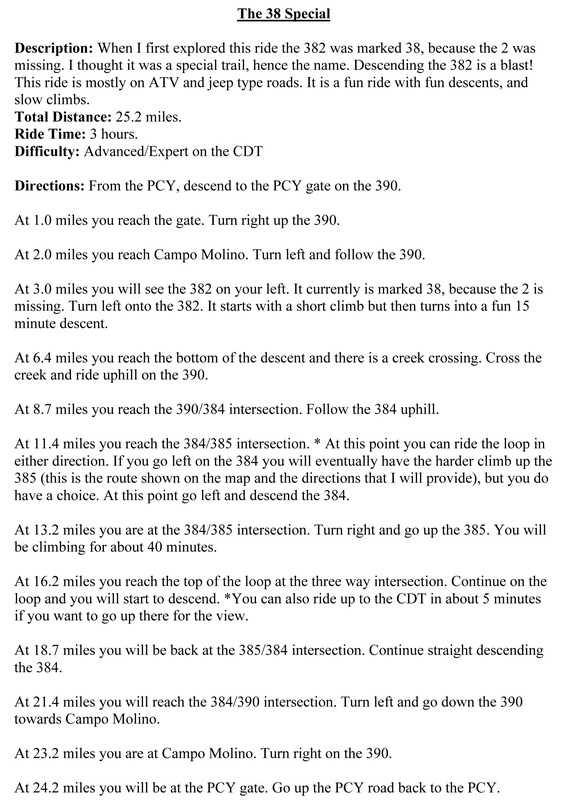 Total Distance: Variable depending on how you return to the PCY from the top of the climb. It is 17.3 miles to the top of the climb. Ride Time: Variable depending on how you return to the PCY. At the top of the climb it is 2 hours and 18 minutes. Ride time: 2 hour and 10 minutes. Ride Time: 1 hour and 5 min.